Current and future Lincolns will have a similar cushioned, luxurious ride to the cars that made the brand famous back in the day. 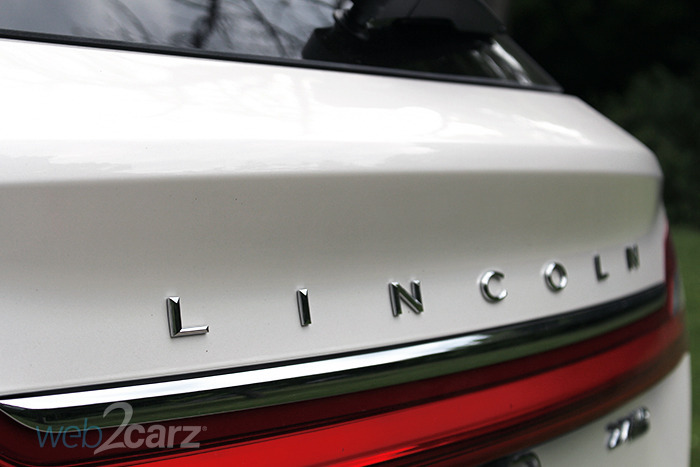 For some time now, it's seemed as if Ford didn't know what to do with the Lincoln brand. It was a brand without an identity and we feared its demise were on the horizon. This is still a possibility, but now it seems that Ford at least has a plan for the brand: channel its past through the new models. Current and future Lincolns will have a similar cushioned and luxurious ride to the cars that made the brand famous back in the day. We got to spend a week with the new Lincoln MKX to find out if the new model from Lincoln fulfills the new (actually old) vision for the brand. We drove it on the freeway, busy city streets and suburban roads to test the MKX in exactly the same ways we expect Lincoln's customers will. Here's our impressions. 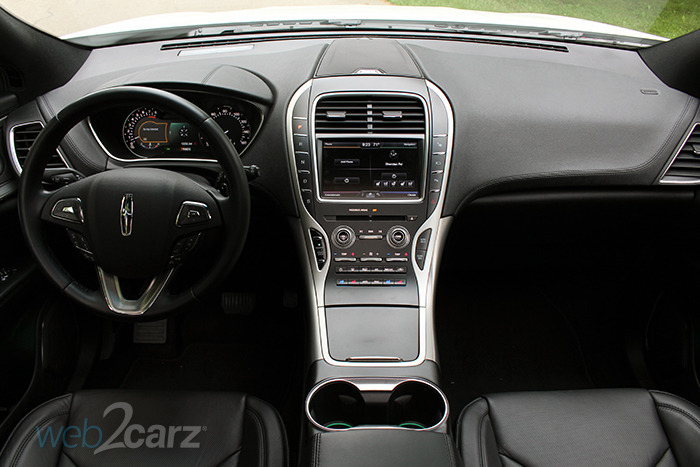 Driving Impressions You'll never be wanting for power in the Lincoln MKX. For regular driving purposes, the 2.7-liter turbocharged V6 engine provides plenty of power. Zipping off the line or shooting around other cars is easy. While the MKX features strong performance, it's not a monster. The power is extremely easy to manage but you won't be winning any drag races. The MKX's powerful engine is a major plus but even better is the soft, cushioned ride. This thing floats over most bumps. While the pillowy ride doesn't make for much of a canyon carver, if you push the sport drive mode, the characteristics of the vehicle change pretty noticeably. Suspension and steering tighten up, throttle response is more immediate and you can actually have a little fun on a curvy road. Adjusting the dampers beyond that and one has to go into the labyrinthine settings in the infotainment system, but it's nice to know you can adjust them. Ride Quality: Cushioned and comfortable with even the biggest bumps resulting in little more than a gentle rocking of the vehicle. Steering: Well-weighted steering that's neither too heavy nor too light. It's surprisingly precise as well, making the relatively large Lincoln feel rather nimble. Acceleration: The Lincoln won't blow the doors off a Charger, but it's pretty quick off the line with plenty of low-end torque. Braking: The brakes, like the rest of the car, feel a little soft, but push down on them with authority and they have no issue stopping the crossover. Handling: There is significant body roll in normal and comfort driving modes, but the suspension firms up in sport mode. Overall, the MKX handles well in most situations and shines while cruising on the highway. Technology & Safety Lincoln didn't skimp on technology for the MKX. The model we had came equipped with voice-activated navigation, SYNC with MyLincoln Touch, a Revel audio system, Bluetooth connectivity, tons of driver's assist and safety tech and much more. All of this is neatly packaged into the center stack in the middle of the dash that flows down in one long swooping swath of screen, buttons and knobs. Some of the controls are accessed via sturdy feeling buttons and knobs, whereas the rest of the controls - mainly anything that takes more than one button - can be found within the infotainment system. While some of things are easy to find, others, like the suspension settings, are buried pretty deep in the system. Infotainment Screen Size/Quality: The 8-inch touchscreen seems large at first, but once the screen is split to show more information, we realized it would be nice if it were bigger. Resolution is high and graphics are crisp and clear. Bluetooth Phone Pairing: We had no issues pairing our phone. It was easy and seamlessly reconnected upon entry. Voice/Sound Quality: Call quality was strong on both ends and the Revel audio system sounds good when playing music or radio as well. Controls: While some features are buried in the infotainment system, operating the controls within the touchscreen is pretty easy. It picks up all of your taps and swipes without issue. Also, the buttons and knobs feel sturdy and of high-quality. Safety: The model we drove came equipped with a lane-keeping system, adaptive cruise control with active braking, anti-lock brakes, traction and roll stability control, canopy safety system, several airbags and more. Exterior Design & Styling The MKX has an elegant figure with plenty of curves and rounded edges. It's attractive and smooth looking, without many hard angles or creases. While at certain angles it can look very similar in shape to the Ford Edge, which is the platform it's built on, it has enough of a luxury presence to set itself apart. The styling is sophisticated and mostly subtle, but it isn't going to before everyone. Shopper's looking for a more edgy look will be more drawn to a vehicle like the Lexus RX. Front: The front is dominated by Lincoln's split grille. 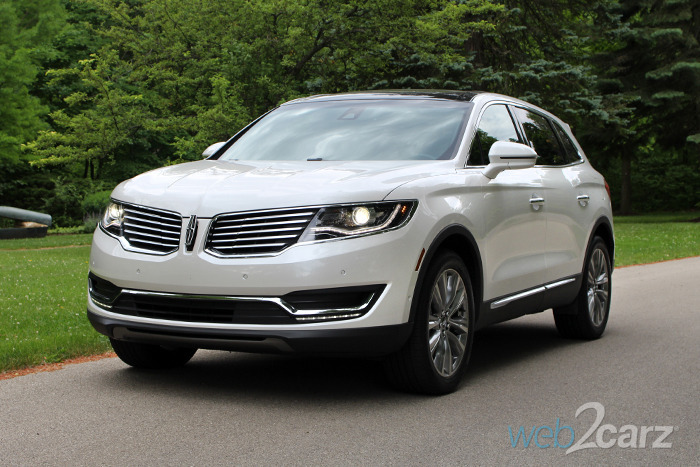 That grill has a tendency to look like a cheesy mustache, but on the MKX Lincoln chose to tame down the taper at the ends, making for an attractive and unique styling element that stretches all the way across the front. 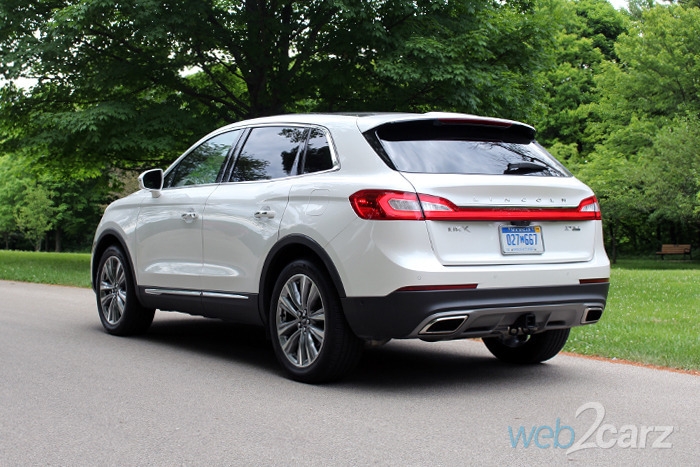 Rear: Lincoln commits once again to a large horizontal line across the rear with a solid light bar that connects the housings for the brake lights. This has been a signature for the brand for some time and we're happy to see it still fits in with what Lincoln is doing. 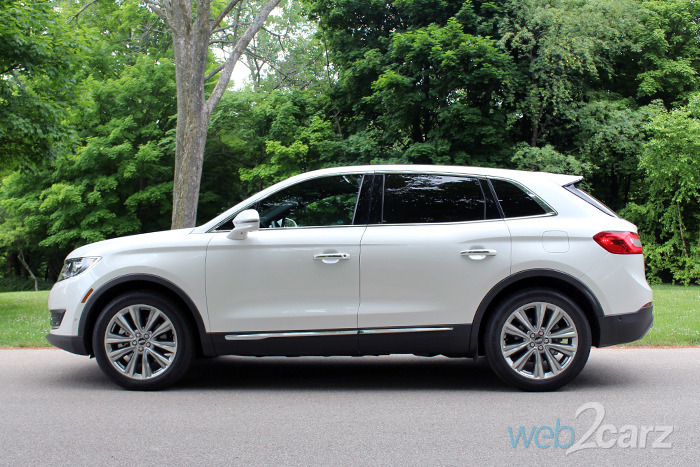 Profile: In profile, you really see the resemblance to the Ford Edge. While we wish Lincoln could do more to differentiate itself, there's only so much the company can do when sticking so close to the Edge's formula. Driver & Passenger Comfort Comfort is where the MKX shines. 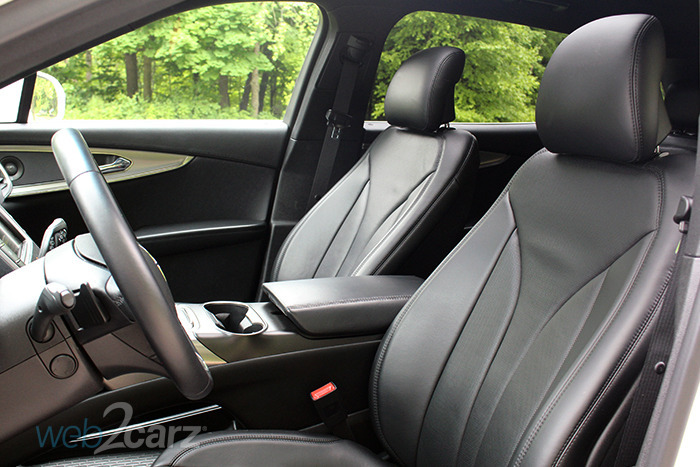 The seats are wrapped in high-quality, soft leather and controls are all within reach. There's plenty of room and you sit high enough to see out the acoustically laminated glass easily. No matter how long your drive is, you'll feel comfortable in this crossover, whether you're sitting up front or in the rear. Front Seats: Large, wide and leather-wrapped, the MKX's front seats provide plenty of space padding and adjustment to be comfortable for even the longest ride. Rear Seats: The rear seats offer similar materials and comforts, though less adjustment and are even heated. Visibility: Front and side visibility is wonderful, but the thick C-pillars make seeing out the rear more difficult than other crossovers we've driven, luckily the MKX's sensors make up for it. Storage & Cargo Room Storage spaces are abundant, but they can be difficult to get to. Even after you get used to them, reaching items you've placed there turns out to be a little difficult. The two shelves beneath the center stack are accessible via the driver and front passenger seats, but they're placed low and aren't flat. Rubber mats and ridges along the edges of the shelves keep things from sliding around, but reaching for an item is best done with the car at a standstill. Door pockets and cargo area are easy to get to and plenty spacious enough. Storage: The shelves behind the center stack are mildly annoying because they're hard to reach and see, but still pretty useful because of the space provided. We recommend tossing most items and gear into the center console armrest or the small storage compartment just beneath the infotainment controls as they're more easily accessible. 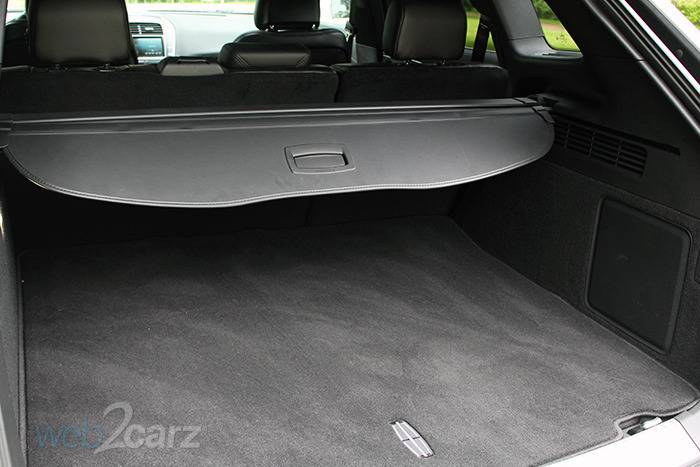 Trunk/Cargo Room: The rear cargo area is plenty spacious and comes with a nice little divider you can use to hide things under. At 37.2 cubic feet and 68.8 cubic feet with the seats down, you get plenty of room to haul around items, groceries or gear. Final Impressions The MKX is a smart move for Lincoln. It feels exactly like what we want a Lincoln to feel like. It has a cushioned ride, good driving dynamics, an attractive exterior and a comfortable interior. While there are some things that still need to be ironed out, for the most part, the MKX is a solid entrant into the segment from a brand that needs a real winner. While we really liked the MKX, we fear the price tag, which can quickly climb near $70k when you add options and go up trim levels, is a bit too high. The lower trim levels are affordable and on par with where this crossover should be priced, but add a few packages and you're looking at a whopping price tag. This is due to Lincoln's packaging of options. If you want one thing, you have to get several others because that's the way the packages come. Lincoln isn't the only brand doing this, but a price tag that starts below $50k and then suddenly jumps sky high, probably isn't right for a brand that has struggled in the last decade.